Seattle’s iconic Space Needle rises 605 feet (184 meters), like a beacon towering over the city. Erected in 1962, this unique building resembles a futuristic flying saucer set on irregular legs. 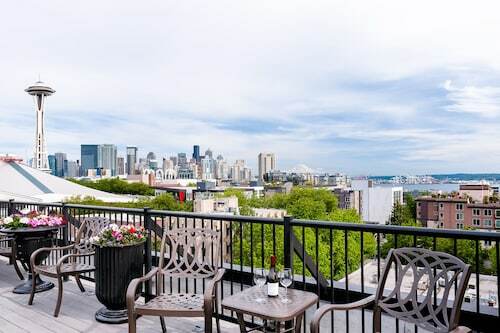 The views are great, whether you’re looking up at the Space Needle from the grounds of the Seattle Center or looking down from the observation platform. The views are beautiful on a cloudy day and absolutely breathtaking when it’s sunny. Children in particular will love exploring the surrounding Seattle Center, with its green spaces and great fountain, and carts selling popcorn and rope licorice. The Pacific Science Center, a sidewalk away from the Needle, is a fun place to spend a few hours. Take in a show at the IMAX Theater, or gaze at the stars in the Willard Smith Planetarium. If you’re hungry, the Center House offers an expansive food court and sometimes entertainment. Browse the gift shop at the Space Needle for all kinds of space-themed souvenirs to take home as a memento. The Space Needle is located in lower Queen Anne, about a 10-minute drive from downtown. Parking for a fee is available. It’s open year round, day and evening. Have a look at our Seattle things to do page to discover even more activities in the area. This three-kilometre waterfront stretch is one of Seattle’s foremost leisure and entertainment destinations. Soak up some of the atmosphere as you wander round. Cycle, kayak or hike across this picturesque island in the middle of Puget Sound and see some of the amazing local wildlife or taste the fresh organic produce from its soil. Stroll along storied streets to find independent shops and restaurants in buildings that evoke the history of the area. Leave the city behind with a day at this beautiful beach in peaceful West Seattle. 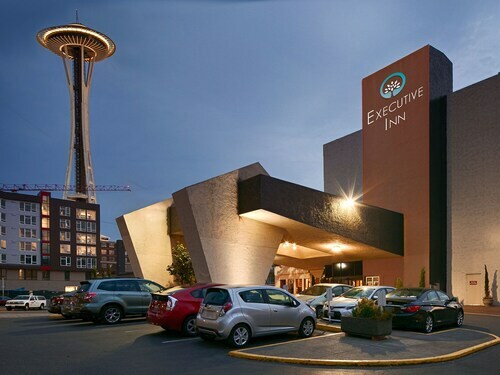 Located in South Lake Union, this hotel is steps from Space Needle, Museum of Pop Culture, and Chihuly Garden and Glass. Seattle Center and Pacific Science Center are also within 5 minutes. Seattle Center Monorail Station is only a 4-minute walk and Westlake Denny Wy Station is 11 minutes. 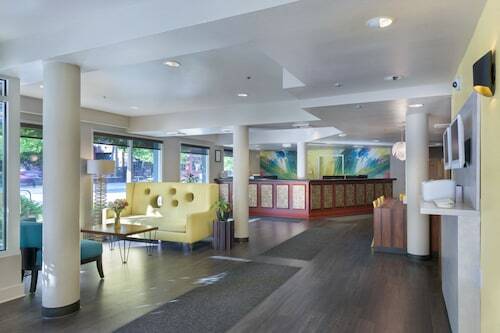 Featuring a funky, modern style, this Seattle hotel is in the hip Belltown neighborhood,5 blocks from Pacific Place and Westlake Center shops. 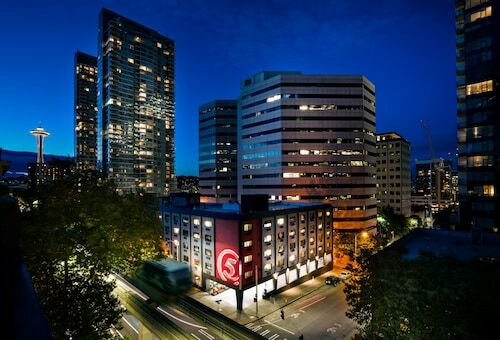 The Space Needle, Experience Music Project, and Pacific Science Center are within 6 blocks. 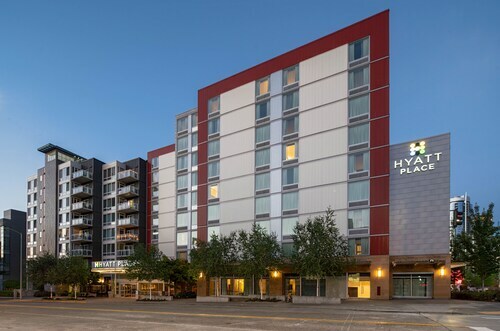 Hyatt Place Seattle Downtown is a 5-minute walk from Seattle's iconic Space Needle, offering unparalleled views of the city from its observation deck. Near the Needle, guests can hop on the monorail and ride downtown, where attractions like Pike Place, a century-old farmers market, await. 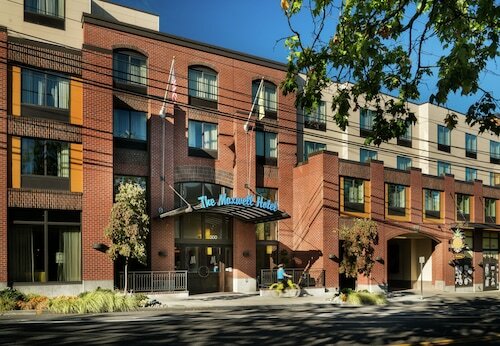 Occupying a handsomely restored 1918 building, this boutique hotel is nestled among restaurants, theaters, and shops in the vibrant Queen Anne neighborhood, 2 blocks from the Seattle Center.